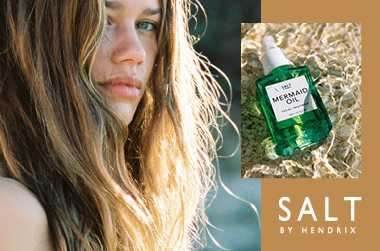 Crafted with natural and organic high-quality ingredients, SALT BY HENDRIX is an Australian-made botanical skincare range dedicated to performance-based, affordable luxury. With fashion-forward packaging that exudes luxury and style, these vegan formulas nurture the skin and soul with minerals, antioxidants and vitamins. Founder Kellie Collis&apos; son suffered from eczema and she desperately began seeking naturally-derived remedies. On a mission, Kellie developed a formula that proved effective, and thus SALT BY HENDRIX was born. Originally consisting of body oils and bath salts, the vegan beauty range soon expanded to body products, hair mists, facial oils and organic roll-on fragrances. Their popularity has risen, not just because of their effective products, but due to their commitment to conscious beauty. The SALT BY HENDRIX products are as much about wellness as they are about beauty. It is important to the brand to know exactly where the ingredients are sourced from, free from harsh chemicals and cruelty-free. Mermaid Oil: a highly moisturising formula rich in Omega’s 6 and 9 to help support skin health, lock in moisture and stimulate cell regeneration. This superfood facial oil is feather light and easily absorbs into skin, leaving no oily residue behind. Eye Babe: to promote fresh, hydrated and youthful eyes. Created with a beautiful cocktail of plant-based oils, this lightweight beauty elixir absorbs easily into skin, helping to reduce the appearance of fine lines while preventing premature aging. Body Glow: Available in two shades, a gorgeous golden bronze and a luminous gold pearl, these body oils will intensely hydrate your body while coating your skin in a stunning natural lust-worthy radiance. With products spanning across skin, body and hair, this natural vegan beauty brand provides an uplifting experience inside and out. I love this scrub! My skin feels like its getting a good exfoliation workout. The granuals are loose and dry, not packed in with oils like other brands. I prefer this because I tend to break out when I use oilier scrubs. Nevertheless this scrub will still give to smooth and supple skin for days afterwards. Smells amazing! The combination of lavender and coconut scent are perfect. Leaves skin feeling soft and smooth. I use it on my face as well and it feels so hydrated. Amazing mask... this mask makes my skin really fresh and glowy. very good for oily skin. very simple to make paste and super easy to wash off.